Knitting Hat for a Man. 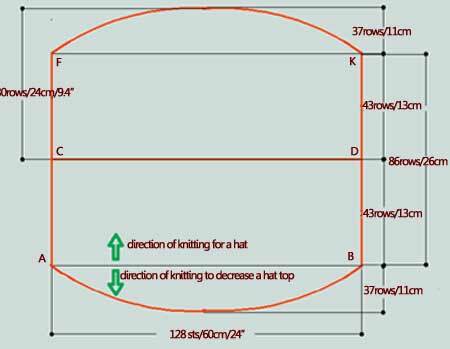 A knitting hat pattern , presented on this page, is one of the ways to design a classic double layers hat. It can be done either the way you can see it on the picture or with the brim folded up to double the thickness. To add a folded brim to your design, total number of rows has to be increased, by the number of rows necessary to knit double height of the brim. Let's look at the pattern which we have to follow while you knit a hat. Line AB is the beginning of knitting. Direction of knitting is from bottom to top. Line CD is a line where we fold a hat to make it double layered. At Line FK begin to form a hat top using decreases. Line AB : pick up stitches from each existing stitch. Number of stitches is equal to the original number of stitches at the line AB. Knit the top of the internal layer forming a hat pattern mirrored about line CD. Working in the rounds with circular knitting needles or double pointed knitting needles. Working flat with a seam using straight knitting needles. 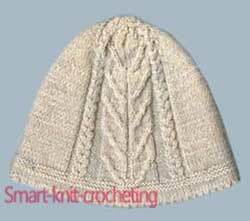 Stockinette stitch is a major stitch pattern for this knitting hat. A folded line CD is formed by two rows: Row 1 - (right side). * Knit 2 together, yarn over*. Row 2 - (back side). Purl. A center piece of the front part is 38 stitches wide. Its stitch pattern shows the rows of the right side only (odd rows). Even rows stitches should be knitted the way they look from the back side: either knit stitch or purl stitch A cable part is separated from the bottom with 6 rows of a garter stitch. Amount necessary: about 170 g.
Follow a knitting hat pattern. 60 cm x 2.14 sts/cm = 128.4. Round to 128 sts. For working a flat hat with a seam, cast on 1 selvage stitch for seaming at very beginning and end of work (130 sts total). Row 1 - 42: Stockinette stitch (right side). Knit a folded line. Row 43: * Knit 2 together, yarn over*. Row 44: Purl. Row 45 - 55: Stockinette stitch (right side). Row 50 - 49: Garter stitch. Row 56: Begin to knit a cable pattern according to a chart. 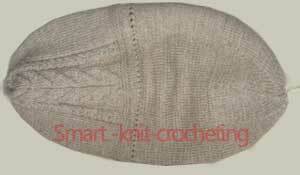 Stockinette stitch is a major stitch pattern for this knitting hat. Row 57 - 86: Continue to follow stitch pattern and a knitting hat pattern. NOTE : Due to a cable pattern of the central part order of decreases described above should be corrected in a cable part of a hat. To avoid distortion of the cable stitch pattern, try to make decreases in the areas where purl "passes" are located first. Rhythm of decreases has to be kept the same: 8 stitches per row listed above. Share all stitches (128 + 2) onto 8 groups: (16 sts x 8) + 2 sts = 130 sts. Knit 2 stitches together at the beginning of every group of 16 stitches. This way you will decrease 8 stitches in each row of decreases. All decreases are made on the right side in the rows: 87,91,95,99,103,105,107,109,111,113,115,117,119,121,123. There will be 8 stitches on the needles after you finish decreases. Pick up stitches from each stitch of the first row. Number of stitches is equal to original number of stitches at line AB (130 sts.) Repeat decreases described for rows 87 - 123. Fold internal layer inside of a hat and sew it on at a few points.